Independently finding the location of Pablo Escobar’s grave online was easy. 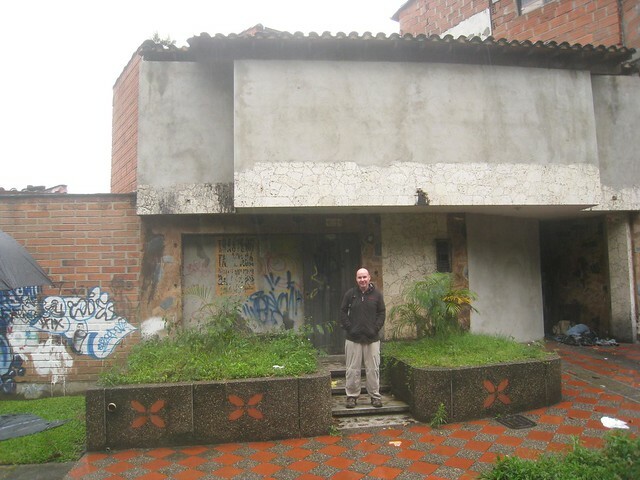 Trying to find the location of the safe house above where Pablo Escobar was shot and killed was difficult, giving me all the more motivation to find it first hand so I could share it here. I went to the folks at PoorButHappy, kicking off a 30-plus posting dialogue. Amongst the comments, I was given the address I needed. A few days later, I recruited Henry and his friend from Holland for the adventure. We took a taxi in the pouring rain from the city center toward the address: Carrera 79B #45D-94, near Estadio Girardot (the city’s big soccer stadium). The taxi dropped us off one street away though we didn´t know that at the time. 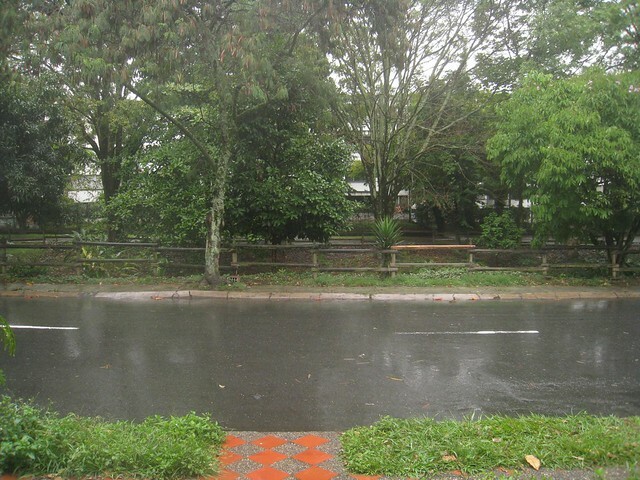 The street addresses in Colombia can be very confusing. We walked around in the rain for about 15 minutes until Henry asked an older couple in the clean, middle-class neighborhood for directions. The first man we asked didn´t know and didn´t seem too interested in remembering such a bad man. However, the second couple offered the info we sought. We found the house, which as you can see from the photos, is condemned. Look closely to the right, and you’ll see a homeless person asleep in the corner. The graffiti is the easiest way to spot the location. Also, if your taxi is having trouble, just remember the house faces the canal running along the street in the neighborhood. Killing Pablo by Mark Bowden. P.S. – After reading this book almost two years later, I found the address of “Street 79A, building #45D-94” mentioned on page 237. P.P.S. – Since my first visit in 2009, the house at this address has been renovated and occupied. As of 2011, the graffiti on the wall was still visible. To learn more about Escobar during your visit to Medellín, sign up for a half-day tour through Latin Hosts. Historical points of interest include the Monaco Building where the Cali Cartel tried to kill him, his last safe house where security forces did kill him and his family grave. Thanks for the tip…. 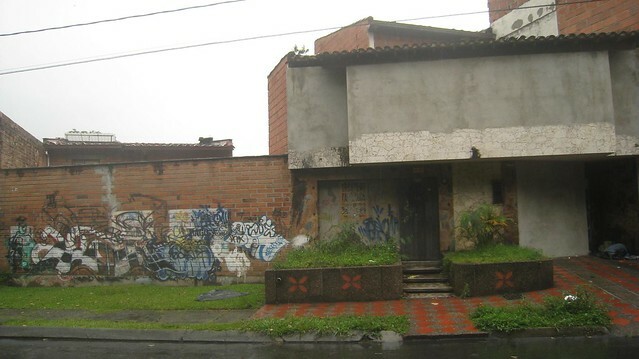 I will be in Medellin in a couple of weeks and I will definitively will go to take a picture at this house. I know that some locals don´t like to see tourists but remember that in Chicago there are tours to the secret locations where Al Capone used to live and do business. The house has been renovated, and it doesn’t look nearly as sketchy now. The only way you’ll recognize it based on my picture is from the graffiti on the wall. Not sure if they will leave that up or paint over it at some point. I am still not able to locate the house given the address on street view google maps. I am looking at Street 79B and cross street 45D (south west of the soccer stadium). It is a very short street. On that street there is a wall that’s totally covered by blue graffiti. Standing in front of the wall, the house you are searching for is on the right side… but sadly it’s totally renovated. But even knowing that’s the place where Pablo died, it’s kinda giving me chills… I have no clue if the people living there even know about it. Most likely they do, but It’s amazing imo. I like that you found the original address. Not a fan of what Pablo did but just to see all this still exist is so amazing. And that some places still stand til this day. Awesome! I should add that since these photos were taken in 2009, the house on the right side was bought and renovated. It looks like a normal middle class home now. I was last there in 2010, and the graffiti was still on the brick wall, but I wouldn’t be surprised if that’s been painted over by now as well. ” who killed Pablo escobar” . Its available on Utube. It clearly showed pictures of the house and rooftop where he was killed. You can see his dead body, the group that killed him with their guns at his head mocking him. And uniformed solders in the street. One can even see the window of the building from where he jumped to the roof of this small one story house . ( now a small business) If it was the government or the Pepes is still in contention. But the location is clear, as the pictures show. as well as the address. The address is shown in the movie on the side of the house. , and both the small one story house with the address next to the door is also still there. I think its Carrerra 79A, 45e no . 91. ( maybe 94 I forget) thats from my memory. I live one block away and walk by it every week. I can see it from my window. I could send a foto. The house has not changed at all, nor has the roof where he met his death. He jumped from a back window of a two story house which faces the canal which is which is shown in daves foto. but he fell on the roof behind, which is cra 79a. thats is where he was shot. The documentary seemed very clear, but the confusion still exist. correction, the side street is 45D, not 45 E. sorry. You are correct Frank, the photo Dave shows of the house is NOT where he was killed. The house in Dave’s photos was his SAFE house. This is where he was when confronted by the police, he jumped out of the window and ran across the rooftops, to the side street 45D and was killed on the rooftop of a single story building (address 45D #91) which is currently a business called M.A. Gestion Inmobiliaria. The rooftop remains the same today as it was in his death photos. I wouldn’t say “DIRECTLY behind this building is the 1 story rooftop where he was shot. He hopped out the back window of the safe house to that rooftop”. The house where he was shot and killed is around the corner on another street. Several houses (about 4 or 5) away. I have sudied the location in Google maps, and the 1 floor house where he died is just in the back of the other where he lived by the river. On Google maps, is it house that has the sign ‘Escuela de Espanol – Spanish School’ and the big gates?